My name is Ken Manford and I was born in Louisville, KY. 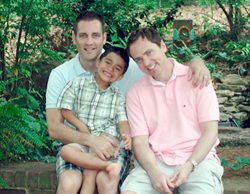 I currently live in Roswell, GA with my partner Jeffrey and our 5-year-old son, Jackson. I came out to my parents and immediate family when I was 22 years old. I lived in New York City at the time and they lived in Kentucky and I decided to come out at that time because I had been in my relationship with Jeffrey for over a year and knew it would be permanent. I did not want to hide my love for him from my family any longer. I sent my parents a coming out letter, but only addressed it to my Mom. I learned later that my Dad was very hurt that I did not address him specifically in the letter. I was able to correct that a few years later when my coming out letter was included in a published book and I had the opportunity to write a preface to my chapter and apologized to my Dad and thanked him for his love and support. My Mom called the day she read the letter to acknowledge that she received it and to say that she needed time to process the information and would call back to talk soon. She called me about a week later and we talked for many hours. She was very understanding and professed her unconditional love and support. I was overwhelmed with emotion after that phone call and felt an enormous sense of relief. Jeffrey & I began to feel a void in our lives and knew we would both make great parents, so we decided in early 2001 to start investigating the adoption process. In July, we began the paperwork necessary for an international adoption and we were matched with our son at the time of his birth in October. Jackson came home from Guatemala in March of 2002 – he was 5 months old. When Jeffrey and I met, I was 28 and he was 26 years old. At the time, I was living in Atlanta and he was in Chicago. Both our families lived in Kentucky, so we were home for the holidays and met in Louisville at a mutual friend’s Thanksgiving party. I moved to Chicago to live with him just a few months later. Incidentally, we did not see one another in the time between meeting and moving in together. Some of my favorite parenting joys are the smiles and hugs my little guy shares with me. I love hearing him call me “Papi” and when he tells me, “You’re a piece of my heart!” The biggest challenge of parenting is simply dealing with 5-year-old boy stuff. We have many family traditions that include, eating every meal together, playing silly rhyming games and of course, all the traditions we are developing around the holidays. We were able to secure a second parent adoption in Texas, so we feel that we have some legal protection for our family; however Texas is a state that will not put both our names on the birth certificate. We worked for a company that had domestic partner benefits, so we have been fortunate in protecting the health of our family; however, the company recently went out of business, so soon this will be a major concern for us. Jackson attended a very inclusive, supportive school in Dallas and we very lucky enough to find an excellent school – also inclusive and supportive of our family in Roswell. We had a huge network of friends in Dallas. As a matter of fact, I started a GLBT parenting group that included about 150 families in the area. It was very satisfying to lay the foundation for the partnership between the Dallas parenting community and the Family Pride organization that continues to grow. I’m looking forward to doing the same for the Atlanta area community! Our family requires that anyone we come into contact with understands that we have the rights of any other family and we believe that they are supportive once they get to know us. We do our best to make people we meet understand that they need to advocate for our family’s rights. We feel very supported and have the education we need available to us; therefore, we do all we can to offer support to families that are seeking it. Consequently, I’m looking forward to Jackson’s start in public school so I can get involved in groups like the PTA and influence parents in the community.